Many are confused about the meaning of agnosticism as it relates to things we as humans are not certain about. The common mistake is combining things we don’t know yet (A) with those that are probably unknowable (B) with those things that are ridiculous (C). 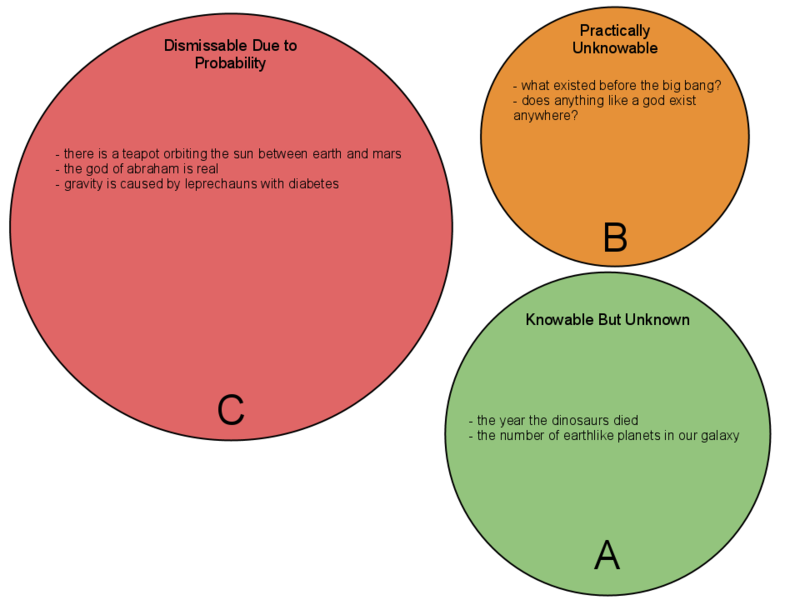 Agnosticism is reserved for types A and B, not C.
To add flesh to this, one can be agnostic about what killed the dinosaurs or whether or not there is alien life in our galaxy. These are answers we can one day learn. One can also be agnostic about whether anything like a “god” exists in the world, i.e. any super-powerful being that has supernatural powers of some sort. This is type B, and it’s likely that we’ll never have an answer to that. But being agnostic to whether or not “Satellites are held in orbit by fairy bow strings.” is simply silly. It’s equally silly to think that our currently fashionable Abrahamic religions are true (which is quite a different claim from the notion of “anything like a god being present in the universe”, mind you). And so on for Santa Claus, Thor, Russell’s Teapot, or any other outlandish thing that offers no foundation for rational belief. So if someone at a hippie retreat asks you if you believe in “God”, you should probably respond that you’re agnostic since context matters and they’re likely referring to any type of god, anywhere. But if you’re in South Georgia and asked by a Christian if you believe in God, responding that you’re agnostic is in my view both evasive and deceptive. In that context the belief in God pertains to a very specific claim, i.e. that the creator of the universe listens to the questioners thoughts 24/7/365 and allows for the suffering in Africa as part of a bigger picture and lesson to humanity. That is not a claim to be agnostic about. It’s a Thor claim, a Santa Claus claim, and a Teapot claim, and it should be rejected just as readily.